Knowing ahead of time if your horse is afraid of fireworks will help you determine how much time you should take to desensitize him. If your horse gets agitated by gunshots, for instance, the loud bangs of fireworks will probably bother him as well. Exposing your horse to loud noises prior to any fireworks can help him get used to the loud booming. There are recordings of thunderstorms and firework noises that are specifically made to work with sound-sensitive dogs. 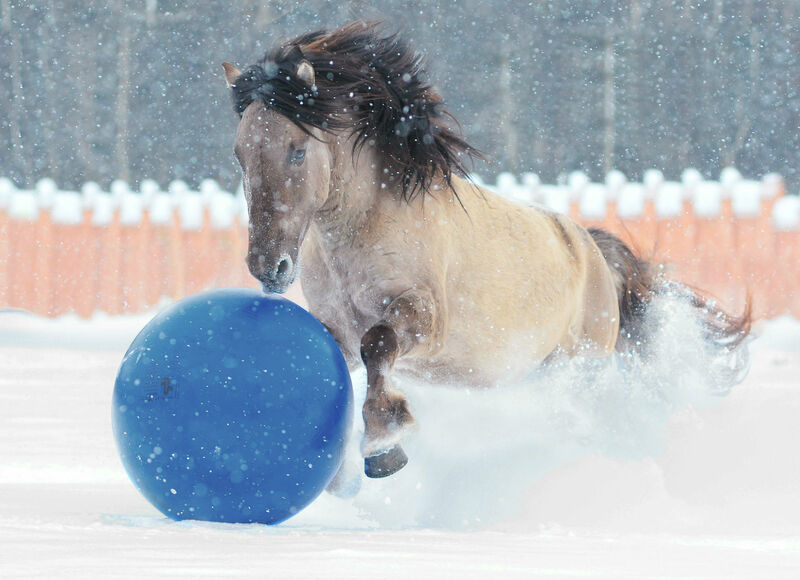 You can purchase one for your horse and play it quietly while he eats his grain or gets groomed. By playing the noise during an activity that your horse enjoys, he will pair it with something positive. Gradually increase the volume after a while. By the time the sounds are playing loudly, your horse should be used to them. If at any point he acts concerned, lower the volume for a couple of days, then gradually increase it again. Once your horse is comfortable with the recordings, make some loud noises (for example, banging two blocks of wood together) while your horse is eating his grain or some special treats. 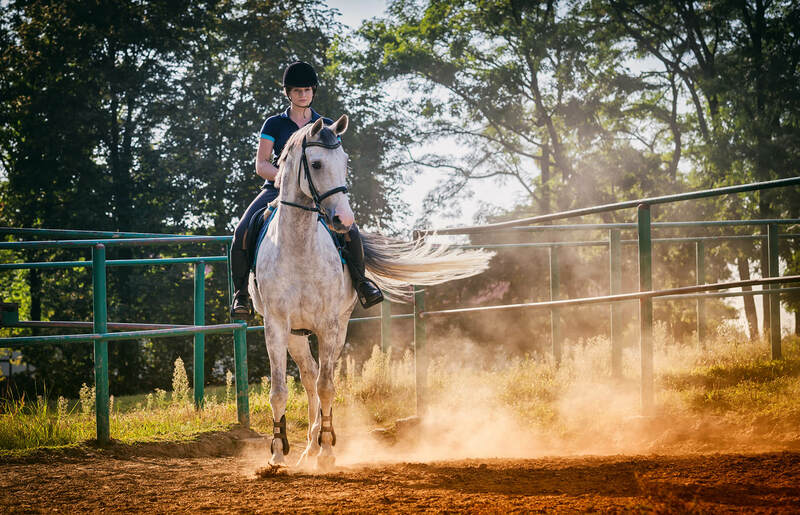 Start by doing this at a distance from your horse and gradually move closer. Make sure not to get too close to your horse while making loud noises, though! Safety should always be the first concern and you don’t want to be kicked. Of course, these sounds won’t have quite the same effect on your horse as real fireworks, but they will help him become more accustomed to loud noises. Mimicking the bright flashes of fireworks may require more ingenuity than the loud bangs. You could start by stringing blinking holiday lights near your horse’s stall, then build up to a disco-strobe-type of light, which you can rent from a party store. Do this for short periods of time and remember to pair it with something positive for your horse. Never leave your horse alone when implementing loud noises or bright lights; you may need to stop or lower the noises or lights if he starts to panic. If a fireworks display is taking place close to the stable or if your facility is located downwind, your horse may also smell a burning odor from igniting and shooting the fireworks. Horses are afraid of fire, so the smell of smoke can also cause stress. Unfortunately, there’s not really any desensitization training to get your horse used to this smell, but rubbing a strong-smelling ointment, such as Vicks Vapor Rub, on the inside of your horse’s nostrils may mask the odor completely, or at least dilute it. During both the desensitization process and actual firework events, stay out of your horse’s stall. If he panics, you could easily get knocked down and injured. If you plan to stable your horse during a fireworks event, make sure to conduct a thorough stall check for anything that could potentially cause injury or harm if your horse spooks. If you plan to keep your horse in the pasture, check the fencing to make sure it’s sturdy and that the area is free of any debris. Always have a friend available to help and your veterinarian’s phone number on-hand, in case an emergency arises. Also avoid riding your horse during times when you think fireworks may be set off. As you know, horses are herd animals and they tend to feel safer in groups. If you have a steady equine companion who is nonreactive to fireworks, pair him with your nervous horse to help him gain confidence. Horses pick up courage from stablemates, so a steadying influence can be helpful. Some horses feel safer outside in a paddock or large field. Your horse may feel like he can move away from the scary sound or sight if he isn’t trapped in a stall. If you put your horse in a pasture, make sure it’s one that he’s familiar with so he knows where the fence lines are. That way, even if he gets spooked, he will hopefully remember where the fencing is and not crash through. If you know your horse is sensitive or skittish, devise a plan of action before the impending day of fireworks. Check your local listings to find out when and where firework displays will occur. If there is a firework display close to your barn, make sure you have an emergency fire procedure in place. If you’re concerned about potential fires, talk to your local fire department about the measures they’re taking to prevent any mishaps. Learn the rules for private fireworks usage too. Many municipalities ban the use of fireworks other than sparklers by private individuals, so don’t hesitate to contact authorities if someone in your neighborhood starts to celebrate the Fourth of July on their own. It might also be worthwhile to determine if you have liability insurance. If your horse gets scared, escapes from your property and causes an accident, you could be held liable for any potential damages. Knowing when a fireworks display will start gives you a heads up if you need to put your horse in his stall or turn him out. Playing music on the radio loudly can help to drown out outside noises and act as a soothing effect. Provide plenty of food to give him something else to focus on; this could be the time to give him an additional flake of alfalfa hay or provide some special treats in a “food toy.” Leave some lights on in the barn to lessen the contrast with the bright flashes of the fireworks. Despite all the precautions horse owners can take, there are some horses who simply can’t handle loud noises or bright lights. Consider consulting your veterinarian, who may recommend a calming supplement, such as B-Kalm™ Paste or sedative.